After over 24 hours of traveling we finally arrived in Singapore. The first two nights we opted to stay in the Little India area of Singapore and the last two in China Town so we could see the majority of the city. We got in around midnight and headed towards our hotel. In the most expensive city in the world we found a very cheap hotel so we couldn’t help but be a little apprehensive about the quality of it. Our taxi driver dropped us off at the Kam Leng Hotel and we were pleasantly surprised because it was pretty nice! Very quirky in it’s design but we like that. Our actual room was a little creepy (no windows) but we didn’t really care. We dropped off our luggage and headed across the street to a local outdoor food stall that was calling our name from the second we got dropped off. It was filled with locals and tons of different food options and we were ready to dive in. We looked around at all the different stalls and we were a little overwhelmed. Thank goodness they had pictures, although unidentifiable at times, or else we would have had zero clue as to what we were ordering. Jesse (my cousin) had spent a year living abroad in China so she used whatever little Chinese she had to order. We ordered two large Tiger beers, some steamed pork buns, and a few different dim sums. We sat down at a dirty round table with a bunch a Malaysians and said cheers… we have arrived and let the Asian adventure begin. The pork buns and dim sum were insanely good and I couldn’t have been happier. We sat there enjoying our beer and soaking in all of Singapore. After our quick dinner we were off to the hotel to call it a night. It’s crazy how even after sleeping and sitting on planes for 24 hours you can even be tired- but we were. The next morning we woke up and had a quick breakfast at this little cafe attached to our hotel which was surprisingly good. We mapped out the day and we were off. Singapore has been it’s own country since 1963 and is primarily made up of three different nationalities: Malaysians, Chinese, and Indians. Now, of course, there are many people from all over the world due to it’s rising economy, it’s clean reputation, and being known as one of the most globalized countries in the world. We stepped outside of our hotel and was immediately met by the heat and humidity. I mean, it was hot out. Really hot. Instant upper lip sweat-stache. We walked down our street of Jln Besar in Little India checking out some colorful Hindu temples along the way. 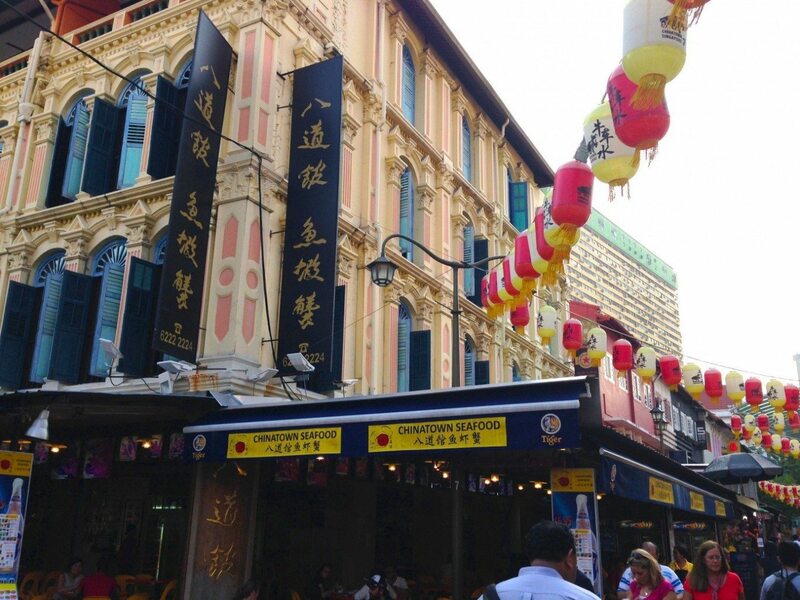 We then headed over to the famous and very colorful Haji Lane. This restaurant and shop lined pedestrian street was very cute and quirky. We stopped into a few shops (mainly to escape the heat) before stopping at this really cute outdoor bar for a quick rum and coke. We watched as the droves of Chinese tourist with selfie sticks walked by. After our delicious refreshment we walked through Little Arab which was a street lined with textiles of all different colors and patterns. We walked around for a while downtown sweating our butts off before ducking into the Museum of Singapore. We thought it would be a nice break from the heat and humidity. The museum was nice and we enjoyed looking at all the weird and very abstract art that was there. We headed back to the hotel to rest up and take a cold shower. Later that night we were going to meet up with our Aussie friends that moved to Singapore a few years earlier. We met them at their favorite restaurant called ‘Mustard’ in Little India. We had a spectacular meal made up of: prawns in coconut sauce, mutton curry, sautéed dahlia, buttered naan, basmati rice, chicken curry, and okra with onions. We ate until we were absolutely blue in the face but, of course, we had separate stomachs for dessert so we ordered a few scoops of Indian ‘ice cream’ with saffron and pistachios. Oh. My. Goodness. What an absolutely insane meal. After washing everything down with a few Tiger Beers we were feeling good. We got in a taxi and headed to this amazing rooftop bar downtown called ‘Loof’. It’s a very swanky bar with a good vibe and a gorgeous view. We stayed there for an hour or so sipping on our expensive cocktails and taking in the Singapore skyline at night. We bid our friends farewell and called it a night. Flash forward to two weeks spent in Indonesia and we were back in Singapore. This time we decided to rent an apartment on airbnb in China Town. The apartment was in a really nice area and we instantly liked China Town way better than Little India. We walked around taking it all in and sweating yet again. As we were walking around we saw something magical… a cat cafe. No, they do not eat cats here. This is a magical tea room where you hang out with kitties while drinking tea. Yes, it’s amazing. Jesse and I stayed in ‘The Company of Cats Cafe’ for an hour before heading back out to go explore some more. While walking around we spotted a foot reflexology spa and instantly booked an appointment for the both of us. While waiting for the appointment we asked the receptionist if she recommended anywhere around there for good dim sum. We sent us over to Yum Cha just down the street and told us it was the best dim sum in the city. We sat down and ordered : prawn, mango, and sesame dumplings, BBQ pork roll, chive dumplings, mushroom roll, steamed pork ribs with a garlic sauce, and prawn wonton crips. All were delicious and we gobbled them all up. We were so excited for our appointment that we were basically speed walking down to the Bath Culture Foot Therapy. We sat down and soaked our sore feet while they served us delicious rose tea. We sat there for the next hour getting every inch of our feet and legs were firmly and beautifully massaged. Whoa. Talk about relaxation. If you are ever in Asia a foot reflexology massage is a must. Trust me. Once we left we walked through a night market and grabbed a Durian ice cream. Durian is an asian fruit that is considered a delicacy but to me it just tasted like a frozen fart. Not a fan. We walked back towards the apartment where there were tons of restaurants and bars and we stopped into a bar adequately named ‘Life Is Good’. We took a glance at the drink menu and ordered a cider. Not because we actually wanted a cider but because it was the cheapest thing on the menu… and it was still $30. We couldn’t justify spending that much money on ONE drink. We sat there and slowly slipped on our liquid gold before heading back home. The next morning we were off to the airport to catch one last flight back home. Singapore is a fun, hot, multi cultural city with so many things to do. This home to 5 million people will always keep you busy.